Joanna and her Amazing Technicolor Interwebs: Shopping at WDW: Vinylmation - What Are They? When you visit Walt Disney World numerous times, souvenir shopping starts to morph a bit. You begin to realize, like in my last post, that you don't want to buy lots of knick-knacks anymore, so you may start getting larger, more practical items. Or you come to the conclusion that maybe you want to start a collection. Aside from my Jim Shore figurines, I collect Vinylmation. I started collecting in November 2010 with 5 - 3 inch Vinylmation figures, and since then my collection has hit 25 or more. Mine is housed mostly on my desk at work. The students like to look at them, and if they knock them off my desk, they don't break, so it's a fun way to take my happy place to work. The question I get the most, aside from "what's with all the Mickey figures? 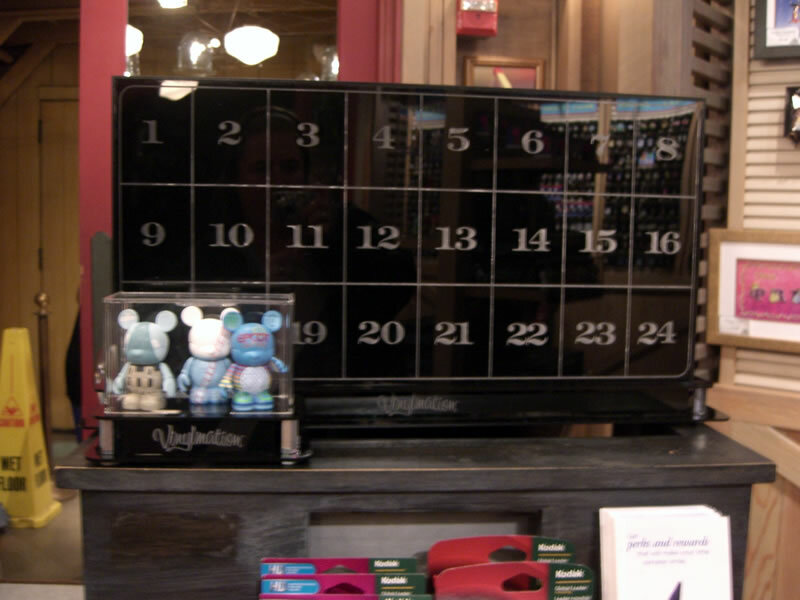 ", is "what is Vinylmation?" So before I explain the joys of Vinylmation collecting, I'm going to give you a really quick "what is it". 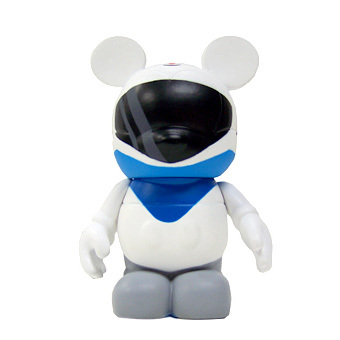 Vinylmation figures are made of, you guessed it, vinyl and come in 2 sizes: 3 inch and 9 inch. The 3 inch figures typically range in price from $10 to $13 while the 9 inch figures are more pricy from $50 to $80. They all start with a basic shape: Mickey Mouse! From there, each Vinylmation is painted to look like something other than Mickey and is part of a series. Currently there are over 50 series which you can browse through here on the official Vinylmation site. Each series usually has 12 different Vinylmations in it plus one chaser (a more rare Vinylmation) and sometimes some variants (one that looks like one of the advertised Vinylmation in the series but has changes, usually in color). Vinylmation are normally sold in "blind boxes" meaning you pick a box from a series, but you don't know what you got until you open the box. 9 inch Vinylmation are always sold in open boxes though. December 19th, 2008 Disney released the Park 1 series of Vinylmation, and since then they have released numerous series of Vinylmation (over 50 different series) and have gained a HUGE group of collecting fanatics! I love the Park series since the figures all look like places or things in the various Disney Parks. I also adore the Cutesters, Animation, Nerds, and Holiday series. I have a Vinylmation ice cube tray, and the 3 inch Vinylmation that looks like an ice cube sits in my freezer to make me smile when I get ice. I also have a Cutester that has bubbles on it to look like a bubble bath that sits on the side of my tub. Blue Monorail Vinylmation is one of my favorites! The 3 Vinylmation you see in the front are in a clear trading box. If you see something you like, you take out your Vinylmation and ask a Cast Member to trade. If you don't see something you like there, you can pick a number from the blind trading box (there in back) to trade. Trading rules can be found here. I'm going to stop this post here since it's getting fairly long and pick up with a trading video in my next post in a few days. Walt Disney World Shopping Tip #3: Start a collection. I recommend Vinylmation, but anything that makes you smile will do the trick!